MINNEAPOLIS, MN – If someone had told me before this NBA offseason that Minneapolis, MN would become an attractive free agent destination, I would have called them crazy. If someone had told me that Kyrie Irving would demand a trade from Cleveland and allegedly wants to join the Timberwolves, I’d have bet everything I own against it; and I would have lost. Its July, 25th 2017 and teams across the NBA are scrambling to make a trade for one of the league’s top point guards. What Kyrie can do at the rim is matched by none; he is without a doubt the best finisher in basketball. What does this ultimately mean? That if someone wants Kyrie’s services for the next two seasons, they’re gonna have to give up a lot, especially considering that most speculation has Lebron leaving the Cavs for Los Angeles after next season. Adding Irving to an already bolstered Wolves squad would instantly make them contenders in the west, but what would they have to give up? In terms of trading, Karl-Anthony Town and Jimmy Butler are off the table, and for good reason. New point guard Jeff Teague could be an attractive trade piece but he can’t be dealt until December 15th. This leaves only Andrew Wiggins, the 6’8” 22 year old forward with all the potential in the world, who was originally drafted by Cleveland before Lebron dealt him for Kevin Love to chase a championship. 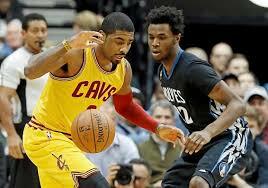 Until this Kyrie hysteria started, Wiggins was expected to receive a 5-year max deal from the Timberwolves. Although Wiggins’ defense has been awful through two NBA season, many experts expect another year in Thibs’ system, and having Jimmy Butler has a teammate, will work wonders for his defensive game. There’s also nothing stopping Wiggins from becoming a superstar in this league; trading him would be a gamble by all means. It ultimately comes down to what head coach Tom Thibodeau has envisioned for this squad going forward. There’s also no guarantee that Kyrie would successfully assimilate, then stick around after his contract expires. This is where the speculation gets interesting: is 5 years of Wiggins worth trading for only two guaranteed years of Kyrie Irving? I don’t know. But the fact that Kyrie voiced a desire to play for the Timberwolves shows that this team has already improved more than this fan base had ever imagined. If the Wolves pull this trade off, they will have top-3 players at 3 positions in their starting 5. A big three including KAT, Jimmy Buckets and Kyrie Irving would give anyone, even Golden State, a run for their money. I don’t think anyone ever thought this would ever be possible. Flip Saunders’ vision is finally coming to fruition. Whether the T-Wolves keep Wiggins or include him in a trade package for Kyrie Irving, things are finally looking good great for a medium market franchise that hasn’t sniffed the postseason since KG was in his prime. Whether you want to keep Wiggins and pass on Irving or not, you have to admit this looks pretty sweet. Adding Kyrie and losing Wiggins would create an imbalance on the team, and eventually a salary cap dilemma. After all, there is only one ball. If the Wolves could create a system that accommodates to Thibs’, KAT, Jimmy and Kyrie, we could have a dynasty in the making. Next Is it time to start panicking about Riley Rieff?